On September 8th, 2003, just over 3 years ago, two women from Georgia picked a Mirror Lake Rec Area pass from a highway booth. They never returned from their Western Uinta hike. Carole Wetherton and her daughter Kim Beverly have last been seen very close to Crystal Lake TH, heading in the direction of Long Lake. The search for the women didn't commence until they missed their flight home on Sep 13th. Their rental car was still at Crystal Lake Trailhead, parked next to Notch Mountain trail sign. The two women's remains have been eventually recovered 9 months later, miles North of the Long Lake trail, and the investigators suggested that the pair may have lost trail in the falling snow, choosing to cross a saddle to the West of Mt Watson (towards Holiday Park) instead of backtracking across a saddle to the South of Mt Watson. Did they make a wrong turn by this cairn? I have been up to the Uintahs for many years and have been to most of the lakes off of the Crystal Lake trailhead. Some of the pictures shown on the website were actually taken at Wall Lake (pictures 5-7). Picture 7 is actually a picture of The Notch, a well-known notch in the mountain next to Notch Mountain. I have hiked on the trail that goes up through the notch and down to Ibantik Lake. I have also taken many pictures similar to the one that these two women took of The Notch as seen from Wall Lake. Just thought it might be an interesting note. It is stated that they went to Long Lake, but the pictures say otherwise. The basic conclusion wouldn't change, that the women were very reasonably prepared (they carried extra layers, space blanket, water, matches) but couldn't find a way back to their car in a storm, stopped for the night in an area of poor trails two miles from their car, and apparently succumbed to hypothermia. But there are big doubts about the geography of the story. And since the family made the pictures public to raise awareness about dangers of Uinta hiking, and about proper preparedness, and especially about using GPS to know precise locations, it seemed to me that the controversy calls for putting those precise locations of the map. Importantly, in my opinion, the biggest mystery of Carole's and Kim's death is not why they may have lost a trail (the investigation assumed that the snow covered the trail, although the snow didn't start accumulating in the area until the night of September 9th). To me the biggest question is why they didn't keep going. An oft-repeated go-down-the-creek rule would have brought them to a well-travelled trail in lower Middle Fk Weber in perhaps as little as a mile, and the woods are wide open for cross-country travel at this elevation. In fact searchers on horseback (!) passed by barely 300 yards from their shelter, too late to make a difference. Was it a trauma, general exhaustion, or darkness which prompted them to stop? A proper reconstruction of their track, pace, and time travelled, might shed some light on these questions. And in addition to speculating how a GPS might or might not have helped, we may be discussing a need for a (much cheaper, lighter, easier-to-use, and longer-lasting) headlamp. Or we may talk about the proper rules for separating a team when one member is unable to walk and another one may be able to summon help. But after picture #19, we've got a problem. It is a photo which was supposed to be the central clue for the investigation. Heavy rain is hitting a lake surrounded by timber country. Wooded slopes raise from the lake's far shore, with some talus bands visible higher up the slopes. There are three very distinct penisulas jutting into the lake. We pressed on to Hidden Lake and circled it ... some timberland on its South shore, but we didn't see any penisnulas or forested slopes behind (doh! read on!). We then backtracked and checked the unnamed lakes on the Northern side of Clyde Lake Divide, and Watson, Linear, Petite, and Cliff lakes between Clyde Lake and the trailhead. Nothing looked like photo #19 there either. The key picture ... at Long Lake? It started to look like perhaps the Notch-Clyde hike wasn't the trip where the women got lost. That they might have been in the area twice. The pictures actually bore date stamps from the camera, only the date hasn't been set properly, in any case, the publisher cropped most of them out (there has been a good deal of water damage at the edges of this film, of course). So no help here. As I already mentioned, the hikers (who just arrived to their Park City timeshare on Sep. 6th) purchased their Mirror Lake pass on Monday the 8th, and the weather has been reasonable in the morning. It only started raining later in the afternoon, then snowing on Tuesday night. The last-sighting reports are contradictory, with most of them saying that a ranger spoke to them near the trailhead on the 8th, while others say it was on the 9th. Some early news reports state that the two have been sighted in Park City on the 9th. It would strike me as highly unusual if the hikers returned to exactly the same high-elevation trailhead, almost an hour drive away from their condo, in a miserable weather, after just completing a nice hike there the previous day. But there are many unusual things in the story, so we just can't rule it out. I tried to contact various people involved in the story, and got a responce from then-county coordinator of SAR. From what he could remember, the pictures might have been taken on two different trips. He remembered one photo the best, with the heavy rain falling into a lake and clouds rushing down from the ridge, for its unsettling, foreboding quality. This of course must have been KSL's shot #19, and he insisted that it was taken at Long Lake. The following weekend we trudged through a nearly foot-deep snow to Long Lake and of course it could not have been the place. Most of the timbered slopes are separated from the water by a cliffband, and on the lower shores on the South side, there are very few trees and no matching set of penisulas. I got over half-dozen shots of Long Lake, from all different angles, in the gallery below. Just ain't got a clue where the pictures from the following section have been taken. The key picture ... at Island Lake maybe? Just when I was about to give up looking, and to postpone any further search till summer, I came across an intriguing photo in Scott Patterson's book. There on page 82 was an image of a lake with low-slung peninsulas and a lone fir tree guarging the more distant point. This being a small faded B&W reproduction, I couldn't figure out if it might be it, but it sure caught attention. OK, so we are heading to the beautiful Island Lake now. Lo and behold, it does have shoreline points which are juxtaposed kind of in the same way as in the dead hikers' pictures! A low-slung, grassy point comes from the left; some distance away on the other side of a lake, another point, topped by a lone fir, comes from the right. A wooded slope rises behind the lake. The differences are too obvious though. The lone fir tree on Island Lake is much smaller, and the point it is standing on is way rocky. The bay before the nearest point is much wider. The timbered hill behind the lake tops out at the skyline, no talus slopes are there further up. 2. The mystery picture is likely made from a hillside or a like point elevated slightly above the lake, rather than from the shoreline. Fellow SP contributor finds the missing link! Just as I kept claiming that the key "KSL images #19 and #20" couldn't have been taken at Hidden Lake, filwould posted a nearly perfectly matching photo - taken right there! The trees, the shoreline, the slopes ... bingo! In July 2007, we succeeded at last in locating the final two photographs retrieved from their camera. As already expected, they have been made a short distance upstream from the canyon, and downstream from the outlet of Hidden Lake. Still, with hardly any major landmarks in the pictures, locating the spots was nothing short of a needle-in-a-haystack problem. Three trips to the area yielded the answers at last. The two final pictures have been taken from virtually the same spot on the right bank of the stream, near an old campsite on the East edge of a small meadow with the view of distant Long Peak. Can you ID any of these two? KSL - no number but according to the uploading order it may have been taken between Hidden Lake and the "Little Meadow". I would like to thank Lynn & Wendy Deppe, Scott Patterson, Shane Burrows, Jim Snyder, Vlad Turchenko, and Matthew Ross for their help with the research and for their insightful comments. The last chapter of the story is not finished yet, of course. I will gladly extend more thanks to all of the readers for helping to fill in the missing info! All of us who use this website should be "interested in real-life backcountry mysteries." I know I am. This Custom Object of yours is very compelling. I only wish it was still summer so I could go out looking for the mystery lake. Thanks Grizz! Of course if it was still summer, I'd rather spend some time crisscrossing the beautiful backcountry there searching for clues than morphing the incomplete results into a page. Well, that will have to wait till next summer. We too have gotten caught up in the mystery route of these two ladies. After considerable time and evaluation my wife and I believe this mystery photo #19 (as you term it) is Hidden Lake. We analyzed 17 key position factors and land marks and feel very confident this is the place. Thanks for your comment. It was my "working hypothesis" too. But when we visited the lake two weeks back, we circled all around it and nothing was even close. South bank is kind of slow-slung and North Bank is a meadow. The only big wooded slope was on the East, and still nothing has any similarity. Most importantly, no peninsulas at all. I would say that it is from the far west thumb of Hidden Lake looking northeast (basically corner to corner in this aerial photo. If you have the right position the following might line up: the lakeshore shape, stand of trees that touches the shore, thick timber behind, and narrow treeless gully coming off of West Notch. No way to tell without going there. The aerial looks credible, and yet, I've passed the North shoreline of this little appendix of the lake twice, on the way to Mid Fork Weber and back. Never saw any points like in their picture. And this little outlet of a lake is just way too narrow. Of course I should have made a photo, doh! But up until that point I was only photographing clear matches. Just didn't care about the guesses and misses yet :/ Hindsight 20/20 as always. Desainme, the Long Lake you looked up is a different one, up Boulder Mountain in Garfield County, couple hundred miles out of the way to the SSE. Interestingly, I started this object as a custom-type and then it had its very own coordinates and map links. I changed object type and the geographical info disappeared! My response was to put a few links to maps into the text, but maybe I just need a whole separate subsection with place names and Topozone / Google Satellite links? What do you think? I am not sure how to attach the photo we took at Hidden Lake. Our analysis was done primarily with our eyes and the mystery photo #19 in hand. The tree that you see leaning on the right side of the picture in the fore front has since fallen down so that is why you do not see it in our picture. Also, our angle is a little to the right of theirs. But we studied the outcrops of land, the tall skinny pine on the farthest outcrop and the small tree to the left of it and they matched. The imbedded log in the closest outcrop was exactly (to the eye) as you see in the picture they took. Anyway, once spring comes perhaps we can all join forces and search a specific UTM grid. is it a digital picture? Very interesting! If you got a digitial picture, you should have no problem attaching it to this page. The "Add Image" link is up in the left-hand side bar, 3rd link from the top, you click "Add Image" -> "New". BTW Mike Berry of WMC planes to lead a season-opener BC ski tour in the area next weekend (Nov 12th). If Ullr the Snow God is benevolent then we just might be able get a peek at this Hidden Lake spot before the winter shuts the road for good. Re: is it a digital picture? Thanks for the help! We posted the picture as "Hidden Lake". See in the above Images Gallery. Time to re-write the story :) Thanks guys, you rock! maps and you have an intriguing question. Good idea just to put the topozone link in there. Sorry to be so far off but I thought that elevation and lakes spelled Uintas in Utah. You have my interest. The "other" Long Lake you picked is on Aquaruius Plateau, a pretty cool high-altitude lake country in its own right although no match to Uintas. It is mostly known for a county highpoint, which is an almost drive-up knoll amidst 11,000+ flats. It appears the location you have on your map is much further north than what KSL has. The KSL map at the bottom of their story shows the shelter location as being just off the trail between Hidden Lake and Jerry Lake. Do you know which one is correct? If I were to bet, I would say the mystery picture is from Hidden lake as Brenden describes. However as the photo progression goes it appears, near the spot where the picture was taken there is a small water fall (charecterized by the waterfall picture splitting two pictures from the same vantage). If you find locations where there are dranages into the possible lakes you may be able to find the spot where the mystery photo was taken. I also believe it is posible the final picture with no number is taken from relatively the same spot just facing south to Mount Watson. But I live 500 miles away, so I will trust those of you have been there. Re: Location of the shelter? Both maps are probably wrong, the location I show is from Shane's website (climb-utah) and that one in turn is from the local papers back from 2004. The KSL map shows a location due West of Hidden Lake & we've checked this area relatively thouroughly this October. All I know for a fact that it is somewhere in Mid Fk Weber - which spans many square miles. The KSL shelter image, and the (inconsistent) tidbits from the media on the attached page, might help to narrow down the possibilies. from Watson across Hidden Lake to West Notch Mtn. looks pretty convincing to me. The Topozone is too coarse to pick up the detail of the southwest cove of the little lake. A tall conifer out on the point says this is the right place. The hikers probably would have lived had the snow not been preceeded by a cold rain. So, it was Hidden. Good to know. Anyway, it appears that they must have gotten north and south mixed up and thought Notch Mountain on their right was Mount Watson, and thought they were heading south instead of north? Must have gotten N and S mixed up? I don't think it is possible to mix up the things this way if their plan was to return from Clyde to Crystal Lake TH. There simply isn't supposed to be a mighty big mountain to your left if you head down to the car. And the visibility was pretty good when the pair passed Clyde Lake. They would have Watson towering on their left all the time. Even the worst maps show it, and the trails get pretty faint past Three Divide Lakes so if one hasn't checked a map until then, this would have been the right time. What if the women planned to continue through the Notch on Notch Mountain Trail, and thought Clyde Divide was the Notch??? 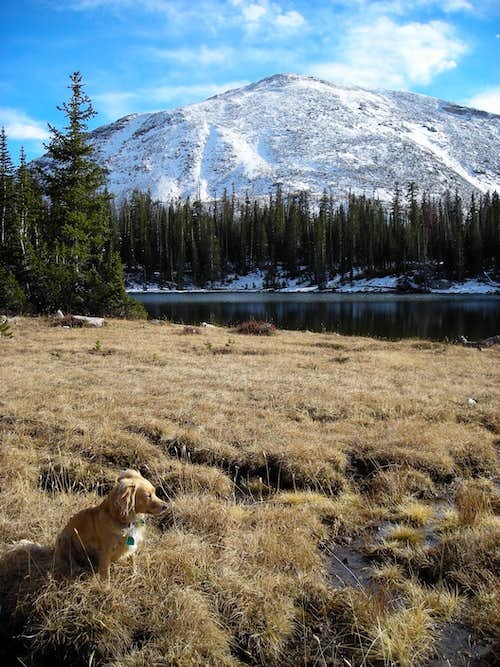 As a side note about the quality of their routefinding... the pictures show they reached Wall Lake by loosing the main trail and following unofficial tracks (just take a look at their picture with Reids Peak ... it is taken from a track in between Notch Mtn Trail and Cliff Lake). But of course navigation between Wall and Cliff is in the thick woods and it's not hard to miss a turn - and not a big problem if you do. Miss-navigating a widely open terrain around Clyde Lake is a completely different business. "Ìû äîëîìàëèñü. Ñèëà - ìîëîäûì.